Baroness Sayeeda Warsi, former Conservative Party chair and Foreign Office senior minister, broke her first Ramadan 2017 fast with Syrian refugees on the Turkish/Syria border. Muslim Aid provided an iftar at the Human Development Foundation near Reyhanli. The Foundation supports widows who have lost husbands, brothers and fathers in the war, and provides a home for orphans. Baroness Warsi met Aysha, a widow from Aleppo, her 11-year-old daughter Kausar, who shyly keeps her scarf over her head and her body hunched, and Kausar’s elder sister, also a widow. All the men in their family were murdered, by a combination of rebels and the regime. The family did not want photos. One of the refugees at the National Syrian Project for Prosthetic Limbs in Reyhanli moved the Baroness deeply. Saif al-din Ali Akta is five, he had the lower part of both his legs blown off in a missile attack which killed his brother and sister. Baroness Warsi stayed with him as he had prosthetic limbs fitted, and saw him start walking a little distance on his new legs. Saif al-din’s mother, Mana, now 33, had to leave her home three years ago without any preparation, because of the siege of Aleppo. Mana and her four children fled towards the Turkish border, but the missile struck them on the way. Saif al-din’s eldest brother, now 18, also survived, but lost the whole of one leg, and Mana still suffers from the pain caused by shrapnel wounds in her legs. Asked about her husband, she turns her face away. “We are giving Saif al-din practice on his prosthetics by luring him with sweets or drinks, to make him walk a little way,” said Dr Rayid al-Musri, who smiled as he saw Saif al-din make progress on his new limbs. Baroness Warsi also witnessed progress at the Boynuyogan refugee camp, where 8,000 people (2.000 families) live in small cube-style houses – a big improvement from the tents they occupied from the beginning of the war until six months ago - and have access to a supermarket where they can spend vouchers for goods. 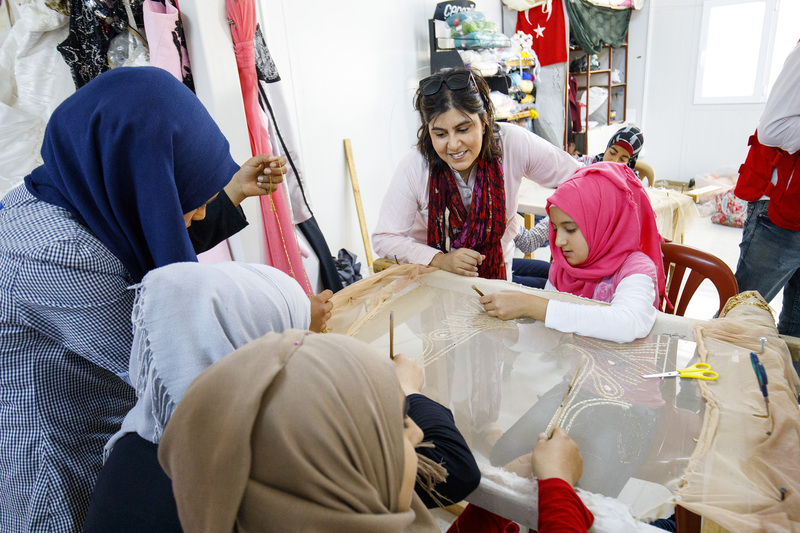 The Baroness also saw girls learning to sew beautiful dresses in a workshop in the camp, giving them a skill and a way of focusing on a constructive activity other than their trauma. “It is heartening to see the inspirational work that Muslim Aid partners the Orphans Care Federation, Syria Relief and Human Development Foundation, as well as the Turkish Red Crescent, have done to ensure that people are not living in squalid camps,” says Jehangir Malik, Muslim Aid CEO, who accompanied Baroness Warsi and who has visited Syrian refugees regularly since the crisis began. “This voucher scheme for shopping is very popular, as it means the families can choose what they want to buy, they have that independence, instead of receiving handouts. It is helping restore some respect and normality to life." Baroness Warsi with girls at Boynuyogan refugee camp. The girls are taught to sew dresses, which gives them a skill and a focus outside their trauma. 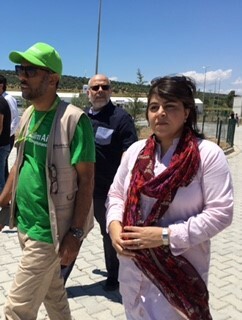 Baroness Warsi and Muslim Aid CEO Jehangir Malik at Boynuyogan refugee camp with Fadi Iskandarani from the Orphans Care Federation. 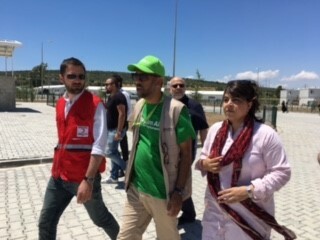 Baroness Warsi and Muslim Aid CEO Jehangir Malik at Boynuyogan refugee camp hosted by the Turkish Red Crescent.